Our Vintage Pinafore PDF sewing pattern is quite the versatile pattern. This “pinny” is great for just about every season and occasion. 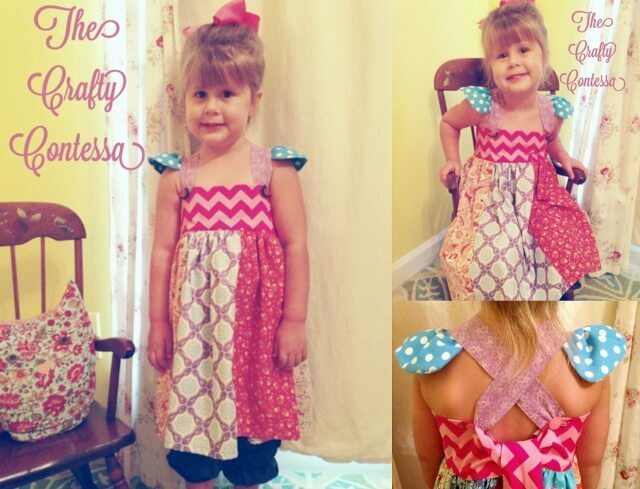 Our valued pattern reviewer, Michelle from The Crafty Contessa used it to make her adorable daughter a very special dress with. She used up several scrap pieces of fabric and with a few modifications and additions she created this very unique and overly cute pinafore. I especially like the cute shoulder accents! Besides, I really love the color scheme she used! No more words needed. Really! 🙂 Now off to check out her blog post with the review! Click H E R E ! !